This morning, September 11, 2014, began with quiet time and remembering the horrific tragedy of 9-11. As I sipped my coffee I purposefully kept the television silent. I scrolled through Facebook "liking" all the all the photo memories that my peeps were posting as honor to the lives lost that day. Quiet time concluded with a pray for the families who relive this day and for the politicians of our country to stay vigilant in protecting our freedoms. As I pulled out of the garage the Panorama Village Lion's Club flags were waving all up and down my Cherry Hill. It was warming to my heart and I knew my trusty telephone needed to quickly snap that picture. Well the scene up and down the street didn't turn out. To my dismay every shot of my own flag on the drive was one without the wind current making the flag fly and wave. However, when I sat down in the car and opened the last picture my heart skipped a beat! 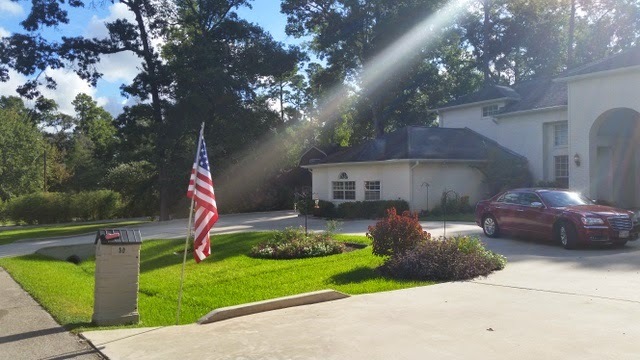 The sun rays opened on the flag pole just as I took the above photo and all I could think was there is hope for our country!